The Battle of the River Plate was fought December 13, 1939, during World War II (1939-1945). With World War II looming, the German Deutschland-class cruiser Admiral Graf Spee was dispatched from Wilhelmshaven to the South Atlantic. On September 26, three weeks after hostilities commenced, Captain Hans Langsdorff received orders to begin commerce raiding operations against Allied shipping. Though classified as a cruiser, Graf Spee was the product the treaty restrictions placed on Germany after World War I which prevented the Kriegsmarine from building warships exceeding 10,000 tons. Utilizing a variety of new construction methods to save weight, Graf Spee was powered by diesel engines instead of the typical steam engines of the day. While this allowed it to accelerate more rapidly than most ships, it required the fuel to be processed and cleaned before use in the engines. The separation system for processing the fuel was placed aft of the funnel but above the ship's deck armor. For armament, Graf Spee mounted six 11-inch guns making it much more powerful than a normal cruiser. This increased firepower led British officers to refer to the smaller Deutschland-class ships as "pocket battleships." Obeying his orders, Langsdorff immediately began intercepting Allied shipping in the South Atlantic and southern Indian Oceans. Having success, Graf Spee captured and sank several Allied vessels, leading the Royal Navy to dispatch nine squadrons south to find and destroy the German ship. On December 2, the Blue Star liner Doric Star succeeded in radioing a distress call before being taken by Graf Spee off South Africa. Responding to the call, Commodore Henry Harwood, leading the South American Cruiser Squadron (Force G), anticipated than Langsdorff would next move to strike the River Plate estuary. Steaming towards the South American coast, Harwood's force consisted of the heavy cruiser HMS Exeter and the light cruisers HMS Ajax (flagship) and HMS Achilles (New Zealand Division). Also available to Harwood was the heavy cruiser HMS Cumberland which was refitting in the Falkland Islands. Arriving off the River Plate on December 12, Harwood discussed battle tactics with his captains and began maneuvers in search of Graf Spee. Though aware that Force G was in the area, Langsdorff moved towards the River Plate and was spotted by Harwood's ships on December 13. Initially unaware that he was facing three cruisers, he ordered Graf Spee to accelerate and close with the enemy. This ultimately proved a blunder as Graf Spee could have stood off and hammered the out-ranged British ships with its 11-inch guns. Instead, the maneuver brought the pocket battleship within the range of Exeter's 8-inch and the light cruisers' 6-inch guns. With the German approach, Harwood's ships implemented his battle plan which called for Exeter to attack separately from the light cruisers with the goal of splitting Graf Spee's fire. At 6:18 AM, Graf Spee opened fire on Exeter. This was returned by the British ship two minutes later. Shortening the range, the light cruisers soon joined the fight. Firing with a high degree of accuracy the German gunners bracketed Exeter with their third salvo. With the range determined, they hit the British cruiser at 6:26, putting its B-turret out of action and killing all of the bridge crew except the captain and two others. The shell also damaged the ship's communications network requiring conning instructions to be passed via a chain of messengers. Crossing in front of Graf Spee with the light cruisers, Harwood was able to draw fire off Exeter. Using the respite to mount a torpedo attack, Exeter was soon hit by two more 11-inch shells which disabled A-turret and started fires. Though reduced to two guns and listing, Exeter succeeded in striking Graf Spee's fuel processing system with an 8-inch shell. Though his ship appeared largely undamaged, the loss of the fuel processing system limited Langsdorff to sixteen hours of usable fuel. 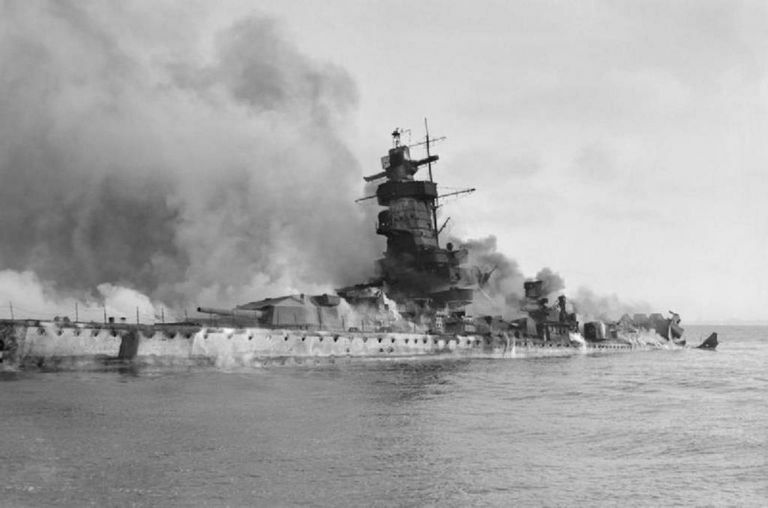 Around 6:36, Graf Spee reversed its course and began laying smoke as it moved west. Continuing the fight, Exeter was effectively put out of action when water from a near miss shorted out the electrical system of its one functioning turret. To prevent Graf Spee from finishing off the cruiser, Harwood closed with Ajax and Achilles. Turning to deal with the light cruisers, Langsdorff returned their fire before withdrawing under another smokescreen. After diverting another German attack on Exeter, Harwood unsuccessfully attacked with torpedoes and suffered a hit on Ajax. Pulling back, he decided to shadow the German ship as it moved west with the goal of attacking again after dark. Following at a distance for the remainder of the day, the two British ships occasionally exchanged fire with Graf Spee. Entering the estuary, Langsdorff made a political error in making port at Montevideo in neutral Uruguay rather than the friendlier Mar del Plata, Argentina to the south. Anchoring a little after midnight on December 14, Langsdorff asked the Uruguayan government for two weeks to make repairs. This was opposed by British diplomat Eugen Millington-Drake who argued that under the 13th Hague Convention Graf Spee should be expelled from neutral waters after twenty-four hours. Advised that few naval resources were in the area, Millington-Drake continued to press for the ship's expulsion publically while British agents arranged to have British and French merchant ships sail every twenty-four hours. This invoked Article 16 of the convention which stated: "A belligerent war-ship may not leave a neutral port or roadstead until twenty-four hours after the departure of a merchant ship flying the flag of its adversary." As a result, these sailings held the German ship in place while additional forces were marshaled. While Langsdorff lobbied to for time to repair his ship, he received a variety of false intelligence which suggested the arrival of Force H, including the carrier HMS Ark Royal and battlecruiser HMS Renown. While a force centered on Renown was en route, in reality, Harwood had only been reinforced by Cumberland. Completely deceived and unable to repair Graf Spee, Langsdorff discussed his options with his superiors in Germany. Prohibited from allowing the ship to be interned by the Uruguayans and believing that certain destruction awaited him at sea, he ordered Graf Spee scuttled in the River Plate on December 17. The fighting off the River Plate cost Langsdorff 36 killed and 102 wounded, while Harwood's ships lost 72 killed and 28 wounded. Despite severe damage, Exeter made emergency repairs in the Falklands before undergoing a major refit in Britain. The ship was lost following the Battle of the Java Sea in early 1942. With their ship sunk, the crew of Graf Spee was interned in Argentina. On December 19, Langsdorff, seeking to avoid allegations of cowardice, committed suicide while lying on the ship's ensign. Following his death, he was given a full funeral in Buenos Aires. An early victory for the British, the Battle of the River Plate ended the threat of German surface raiders in the South Atlantic.